Step 3. In a bowl, beat the cream until it is light and fluffy. 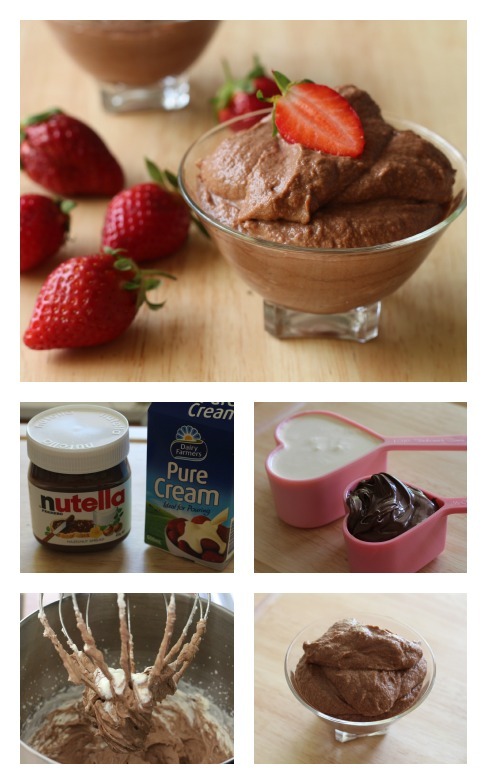 Then add Nutella and continue to beat until thoroughly combined. Step 4. Pour into individual serving bowls. Chill for 6 hours or overnight. You can top this with fresh raspberries or strawberries for a decadent dessert or grate white chocolate over the top. If you want to give this recipe an espresso flavour just place 2 tsp of instant coffee into a cup and add a teaspoon of hot water to dissolve. Add this to your mixture. I used pouring cream which I think is better than thickened cream as it has nothing added.